If you look at the Rogue Valley on a map, you’ll see that it lies roughly between 42 and 43 degrees of latitude. This latitude, which affects the length and intensity of growing seasons, puts the Rogue Valley in great company with some of the world’s most prominent wine-producing regions—including southern Europe, Argentina, Southern Australia, and New Zealand. Growing grapes becomes difficult outside of the 30–50 degrees of latitude where most of the world’s wineries are found, and the Rogue Valley lies near the middle of this special “Goldilocks” zone. It takes more than latitude alone to grow exceptional grapes, though. Quality fruit requires the right climate: a long, warm growing season that lasts until the end of fall, giving the grapes time to reach their peak maturity before harvesting. The vines then need to be chilled enough over the winter to activate healthy growth the following spring. These two factors, measured in terms of degree days and chilling hours, are balanced just right in the Rogue Valley, resulting in grapes of stellar quality. Humidity, often the bane of vineyards, isn’t a problem for most of the Rogue Valley. Summers are warm and dry, and here at 2Hawk, they’re punctuated with brisk afternoon breezes that keep excessive moisture at bay. The Rogue Valley is far from a homogeneous place, however. Soils vary widely throughout the region, ranging from rich, sandy loam to challenging, hard clay. 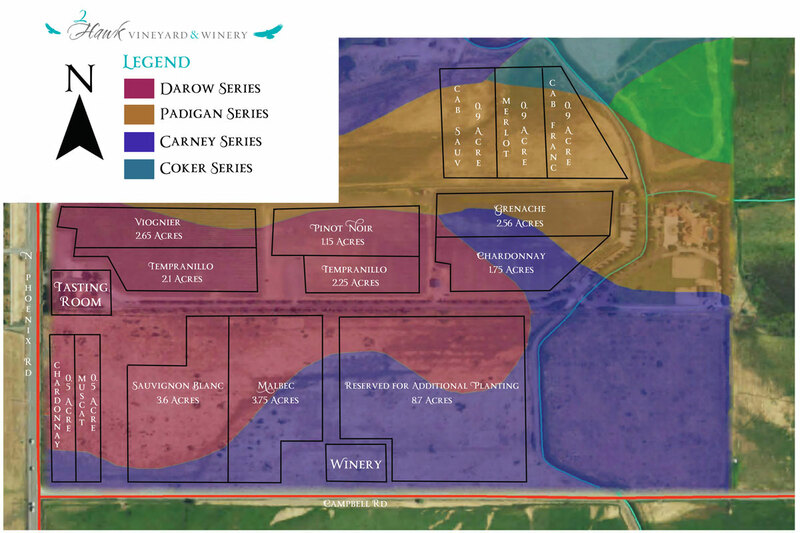 2Hawk’s vineyard alone has four distinct types of soil, giving us the opportunity to appreciate the region’s rich and varied terroir, which may be a little different just a few yards away! Throughout the region, higher elevation slopes give rise to growing opportunities for cooler-climate varieties, while warmer pockets can be home to varieties that thrive in the heat. Far from a handicap, though, this diverse array of soils and microclimates allows the Rogue Valley to produce more than 70 different varieties of world-class wine, each providing an opportunity to sample a unique and special take on the region. We could go on for pages, but this gives you a sense of why we’re in love with Southern Oregon’s Rogue Valley and the wines we make here. To truly appreciate what makes our wines special, though, you must try them for yourself. Stop by our tasting room to savor our current wines, or visit our online store to find something special. In future posts, we’ll discuss shopping for wine, making wine, and tasting wine. Anything specific you’d like to learn more about? Please let us know! How does a winemaker buy wine? Find out in our next blog post!